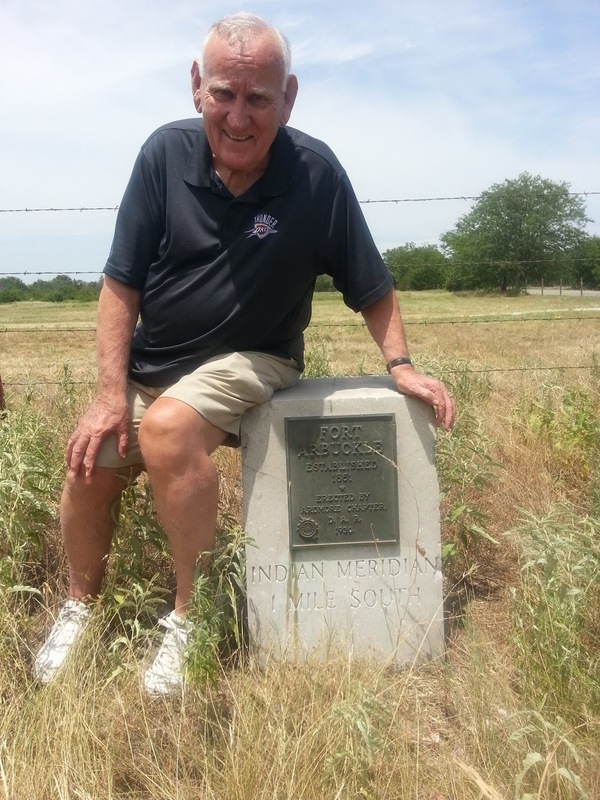 Colonel Norman A. Lamb, United States Army (retired), is pictured here sitting on top of the state marker announcing the location of the historic U.S. Fort Arbuckle (est. 1851) in south central Oklahoma. Norman's military background is quite impressive. He was the U.S. Army liaison to West Point from Oklahoma for over a decade, the Secretary of Veteran Affairs for a record setting nineteen years (serving in this cabinet position under three separate governors), and a multi-term Oklahoma state senator, holding various legislative leadership positions in the state assembly. His son, Todd Lamb, is the current Lieutenant Governor of Oklahoma, and in the opinion of many (including me), the next Governor of Oklahoma. I've met very few people who are able to converse on Oklahoma and United States history with the ease of Norman Lamb. Norman is 78 years young. He went with me yesterday as I made hospital visits in OKC and then on to Falls Creek, the world's largest youth encampment. Norman had mentioned to me that he wanted to see the location of the historic Fort Arbuckle. Over the last decade I've become friends with the homeowners who live on the grounds of the former fort as I did research for Red Earth Courage and Enid's Night of Generals. So yesterday Norman and I made our way to the site of the old fort. We ended up having a wonderful visit with a woman named Porte (pronounced Porshe) who has lived on the grounds of the old Fort Arbuckle for over fifty years. Her husband's parents lived on the site of the old fort as well, and that is where her husband was born over seventy years ago. After giving her a copy of one of my books, she gave me a pistol ball from an old Patterson "cap and ball" revolver that had been embedded in the grounds of the old fort. She also gave me one of the earliest .44 caliber bullets made for the infamous Smith and Wesson revolver that won the west, also discovered on the grounds of the fort. 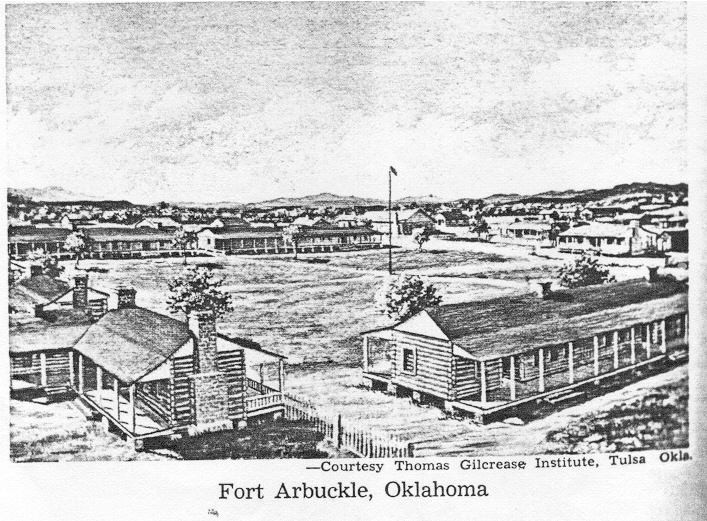 Fort Arbuckle was established April 19, 1851 by Captain Randolph B. Marcy. He chose a location on Wild Horse Creek, just west of the creek's mouth at the Washita River, in what is now south central Oklahoma. The location was just north of a range of mountains that the French trappers and Indians called the Ouachita Mountains, but the soldiers spelled phonetically "Washita" Mountains (same with the river that runs near the mountains). Captain Marcy named the new frontier fort he established Fort Arbuckle in honor of the respected General Matthew Arbuckle who had died of cholera just a little over a week earlier (April 11, 1851) at Fort Smith (Arkansas). The Ouachita Mountains south of the fort would eventually take the name Arbuckle Mountains because of their close proximity to Fort Arbuckle. 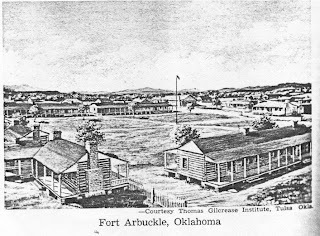 Fort Arbuckle was built by the United States army to protect the recently relocated eastern civilized Indian tribes--primarily the Chickasaws and Choctaws--from the native Comanche, Kiowa and Cheyenne Plainsmen Indians who did not take kindly to other Indian tribes encroaching on their lands. The United States had signed treaties with the civilized tribes that guaranteed their protection in "Indian Territory" and Oklahoma's earliest history is the story of the locating and establishment of military forts (Fort Smith, Fort Gibson, Fort Towson, Fort Washita, Fort Arbuckle, Fort Cobb, Fort Sill) for the purpose of protecting civilized Indians from Plainsmen Indians. The soldiers stationed at these forts also ended up protecting wagon trains that crossed through "Indian Territory" on their way to the gold fields of California (think Lone Ranger). In the 1820's, 30's, 40's and 50's the finest graduates of West Point were assigned as officers to Indian Territory, to the land that would eventually become Oklahoma. Though Oklahoma's Native American history stretches back for centuries, the earliest white settlers in Oklahoma were soldiers. Most people don't know that as late as 1801, 2 out of 3 white Americans lived within fifty miles of the Atlantic ocean. There were only four roads over the Appalachian Mountains that headed west. Anything west of the Appalachians was considered frontier, and no American lived west of the Mississippi until after 1803 and the Louisiana Purchase. Our nation has exploded in growth in a short 200 years. It's hard for young people today to fathom what America was like as late as fifty years after Independence Day (July 4, 1776). (1). Captain Marcy, who founded Fort Arbuckle on April 19, 1851, would explore the headwaters of the Red River (the river that divides Oklahoma and Texas) the following year (1852). Accompanying Captain Marcy for that Red River exploration was a young lieutenant named George B. McClellan. Young George would eventually fall in love with Captain Marcy's daughter Mary Ellen (Nelly) Marcy, and the two would marry. McClellan would later be promoted to General at the beginning of the Civil War, and President Abraham Lincoln would eventually appoint McClellan as the General-in-Chief of the entire Union Army. Lincoln famously fired McClellan for not being aggressive enough in taking the fight to the Confederates, a trait of reticence probably developed back when McClellan and Marcy made a major mistake in charting the Red River. McClellan, however, was a proud man and took offense at his sacking. He ran against Abraham Lincoln in 1864 for the Presidency of the United States. McClellan would lose the Democratic nomination and Lincoln would be assassinated in April 1865. General's McClellan and Marcy had the beginnings of their long relationship in the Indian Territory that we now call Oklahoma and the old fort we call Arbuckle. (2). The first secret mission of the Civil War (as recorded in the Official Records) had as its target destination Fort Arbuckle. Young Lieutenant William Averell was commissioned by Abraham Lincoln and Winfield Scott to dress as a confederate and make his way from Washington, D.C. by train to St. Louis (where the railroad ended just west at Rolla, Missouri), from Rolla to Fort Smith via stage coach, and then from Fort Smith to Fort Arbuckle on a horse. Averell carried a handwritten order that Union troops stationed in Indian Territory were to evacuate to Fort Leavenworth in Kansas and then to other locations to the east. Lincoln needed his finest officers and troops to help defend the Union. In essence, the U.S. government's commitment to protect the Indian nations was abandoned. The story of Averell's horseback ride through Indian Territory to Fort Arbuckle, chased by confederates the entire five day journey from Fort Smith, is one of the most amazing unknown stories of the Civil War and forms the basis of the two books Red Earth Courage and Enid's Night of Generals. The mile and a half train of troops and dependents that left Fort Arbuckle on May 3, 1861 and headed north (guided by the legendary Delaware Indian Black Beaver) would include many future Union Generals and Medal of Honor recipients who would help defeat the Confederacy. (3). Most Americans have forefathers who came to the plains of the Midwest and the west coast of the America's during the 1849 Gold Rush or later. These western pioneers usually rode by wagon train in groups of 50 to 70 people. The mandatory guidebook for that journey west of the Mississippi was written by Fort Arbuckle's founder Randolph Marcy. The book was entitled The Prairie Traveler: A Handbook for Overland Expeditions. The United States government printed it, every wagon train had multiple copies of it, and it told in detail how to spot peaceful or hostile Indians, how to find water, how to start a fire, how to protect the camp at night, and a host of other invaluable guidelines. A first edition copy of this book, originally published in 1859, will cost you thousands of dollars. It was the best selling book in America from 1860 to 1885. The author was the founder and first commander at Fort Arbuckle. (4). The historic Buffalo Soldiers of the 10th Cavalry were stationed at Fort Arbuckle after the Civil War. I will be writing a future post on the importance of these freed slaves who served in the United States army at a later date, but their presence alone at Fort Arbuckle makes this fort extremely important. So, yesterday was a very interesting day for me with Norman Lamb. It's great to have friends who are as interested in connecting the historical dots as I.
Springer isn't far from there at all. How great to be able to spend some time speaking with someone that lived before our time, and heard stories from his family and friends families that would never make it into history books. Of course, this is of special interest to me as a member of the Choctaw Nation of Oklahoma. Good stuff, Brother, and I'd love to see you make a separate blog for all these great stories from the Indian Territory! Yakoke! Ome, chi pisa la chike! I once got in trouble for defending those who speak in an unknown tongue! I think Eric is on to something. A blog devoted to the stories of Oklahoma and even Indian territory days would strike a chord I think. 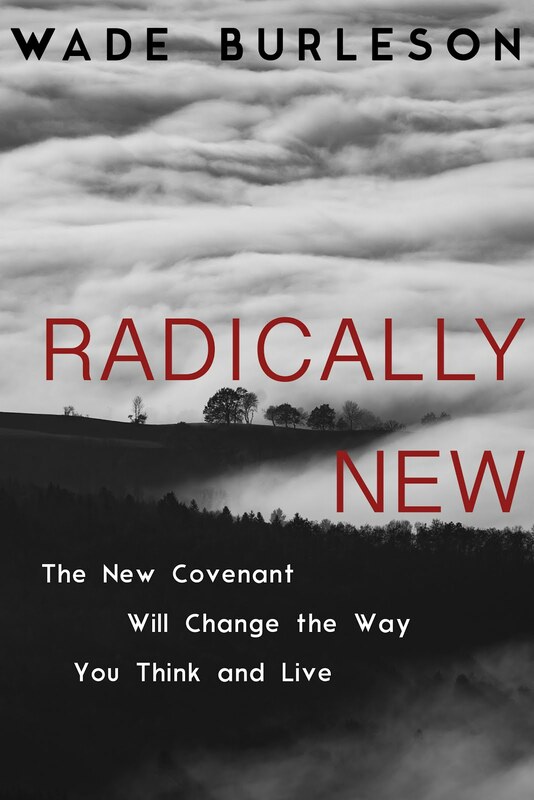 It's readership might be small [might not be] but I'll bet a faithful readership would result. Think about it. Yeah Boomerang is awesome. My members own the Arbuckle Mountain Fried Pies at exit 51 by Falls Creek. I would have loved to have met you. I’ve spent many a happy hour at Falls Creek as our church in Grand Prairie, TX went every year. I was a teacher in the high school department that ‘qualified’ me to tag along. The first time I went, the boys wanted to talk and laugh all night. 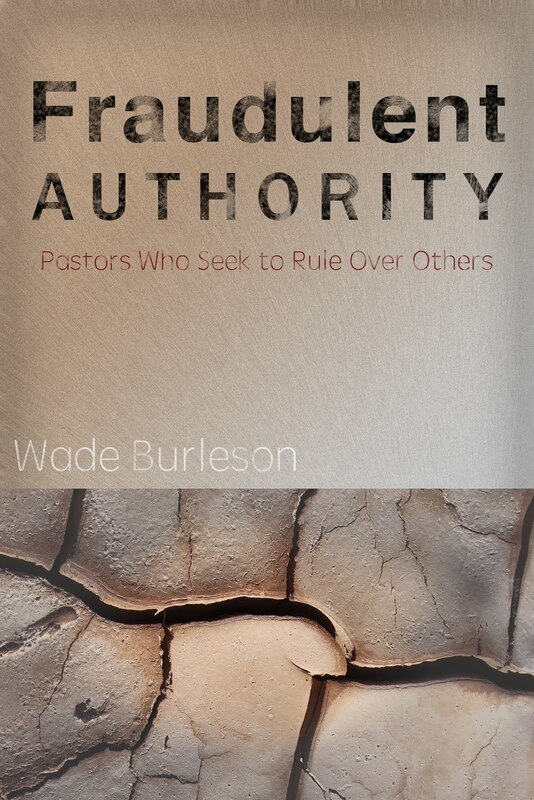 I felt sorry for our pastor as he pleaded for them to stop. “Some us old folks need our sleep”, but nothing worked. For the rest of the week, there was no talking after the lights went out. Well I'll be! We stopped at the Fried Pie place at Exit 51 (the Falls Creek exit) and I bought Norman an apricot fried pie. He said it was "the best I've ever had." The store was a bee-hive! We met two families in the store who knew both of us, and struck up an engaging conversation with the employees (must have been a dozen). They had HUNDREDS of pies and said that the Travel Channel had just featured them on their "Best Places to Eat in the World" and traffic has been non-stop. Small world. Every now and then I get inspired to write a post on Oklahoma history. The key word is inspired. I wrote this post in a little over an hour. If I'm not inspired it is - work! 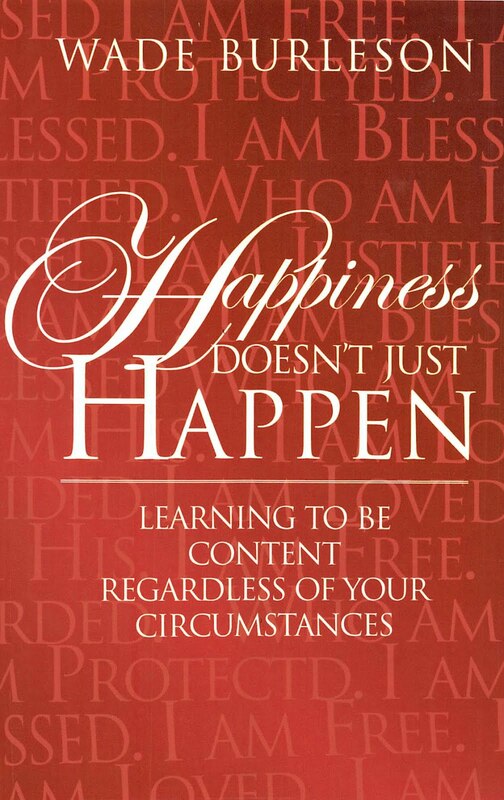 :) I agree with you (Paul) that maybe a handful of people might read it. Too much work for too few! Laughing. It's amazing that I can write a controversial post that says nothing and tens of thousands read it. I write a post with substance that actually says something but is not controversial and a few hundred read it. I think that's a statement on our culture. How may I do so? Hi Wade. My name is Daniel Hoggard. I hope that you are able to provide me with some material I can search. My Great-great grandfather William"Bill" Hoggard lived in Chickasaw territory during and after the Civil War. Apparently at Fort Arbuckle. He made wagons,buckets, piggins and stuff.My great grandfather was born there as well as other of his siblings. Are any records available to see if he is mentioned?